cleese and bean. Fabulous painting, but not quite 100% them. I think. In Moscow today terrible heat!!!!! Yeah....Rowan Atkinson alright..looks too young in here! 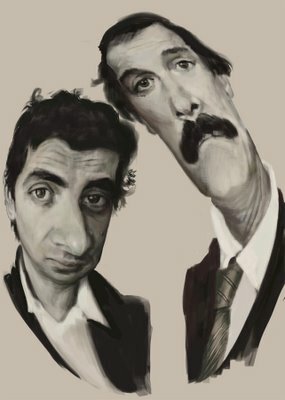 Really good caricature of John Cleese, and anyways a like the Atkinson one. All the stuff that you show on the blog lately, is only for the blog or is for sale too? It's a great work... You...You... really are a great polyvalent artist... All the work that here you show to us is good as minimum, the rest are magistral... Whenever I open your blog I learn a lesson. Congratulations. Thanks Carlos! :O)I call it "blogart".I draw it only for blog.When is "Nocturna" will out? 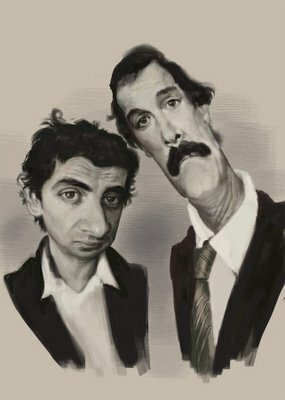 These are great caricatures! I linking you up with my blog and would love to trade links with you. Keep it up. Спасибо Томас! :О)У тебя хороший блог.Ещё раз спасибо,что нашёл возможность написать по русски. Oh I think your Cleese is spot on.